Are you tired of doing the same old thing? Are you wondering what you can do to add a little fun and excitement in your life? Well, I’ve got the answer for you! It’s the latest and greatest pastime of the season! What am I talking about? Indexing the 1940 Census, that’s what! You haven’t tried it yet?? You didn’t know about it? Oh, have I got the website for you! Check it out here - The 1940 Census. It will help you get started on all the fun! You say you're already an Indexer and/or Arbitrator, but didn't know where to get help and instructions? You say you need some help to sharpen your 1940 Census indexing and arbitrating skills? You say you’d like to take part in a webinar or watch some training videos? Well, I can help you out with this too! Just click on the links below to start sharpening your skills. Well, that’s all there is to it! Have a great time helping out with this very important project. And thank you!! 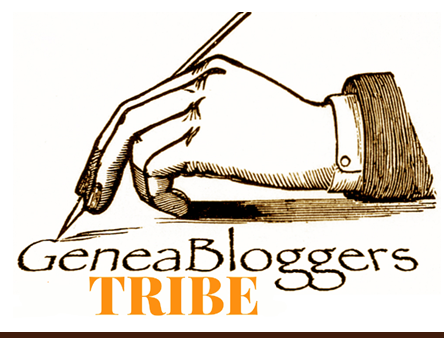 Disclaimer: As part of the1940census.com ambassador program this blog post enters me into a drawing for a $100 Amazon gift card. Following the death of my maternal grandfather, Debs Warren Webster, in 1994, my mom inherited this briefcase shown in the photo. To my surprise, the briefcase was full of photographs, letters, and other treasured items of genealogical interest. From looking through this briefcase, I found that our Webster family had a direct-line U.S. Civil War ancestor, something I hadn’t known, or even thought of, before especially since my grandfather was born in Brazil. I’d say that this briefcase was one of the catalysts to beginning my family history journey. Do you have your own treasure-laden briefcase, cardboard box, file drawer, etc. waiting to be discovered? Check with your grandparents, aunts, uncles, cousins, etc....You never know what genealogy gold you may find! 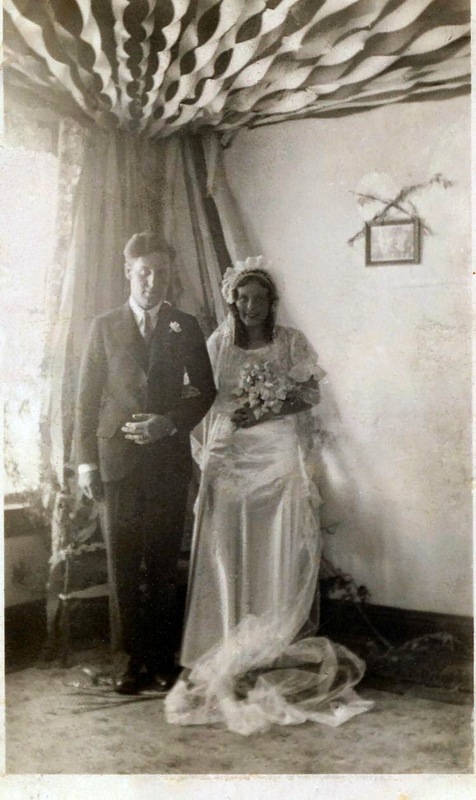 You may remember from my previous post Wedding Wednesday - Arthur Harry Iverson and Ingrid Anna Gillberg, that Arthur and Ingrid were married at the home of Ingrid’s parents in Ely, Nevada in 1931. So I did a search in the 1940 census for Nevada (yep, that state is now searchable), in case they were still there in 1940. No luck! Okay, now what? I looked more closely at what information I had for Carl and Hilda and what else I could find on them from Ancestry.com and voila! Here were clues I could use! 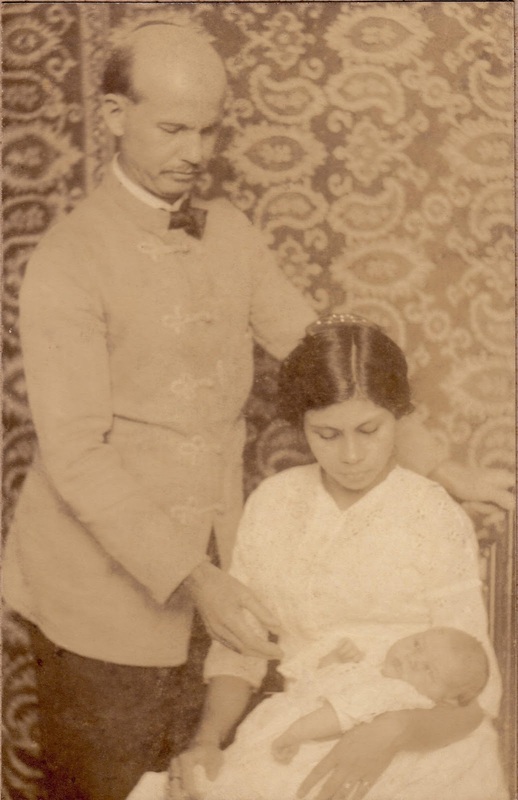 Carl and Hilda both immigrated to the U.S. from Sweden. They both had Declarations of Intention from 1939 and those papers had an address on them! Hurray! I also found a U.S. Naturalization Record Index Record for Hilda from 1942 and that had an address on it as well! The addresses from the 1939 and 1942 documents were different. Well, now I had something to go on! So, it’s off to SteveMorse.org I went in hopes of finding them in the 1940 census! Because the above image of the 1940 census is so small, I decided to split it in half. Hopefully this makes it easier to read. It’s really amazing what the 1940 census can tell us about the kinds of lives our ancestors were living at that time. It was kind of sad to see that my Great-Grandpa Carl was working as a vegetable peddler from a private truck. Of course, this was during the Great Depression. The census states that Carl was engaged in Public Emergency Work, and was seeking employment at the time. In Sweden he worked as a tinsmith, according to a passenger list and subsequently he worked as a baker and laborer here in the U.S. according to several census records and my own Grandmother Ingrid's personal history. I really appreciate the sacrifices my ancestors made to come here to the U.S.! 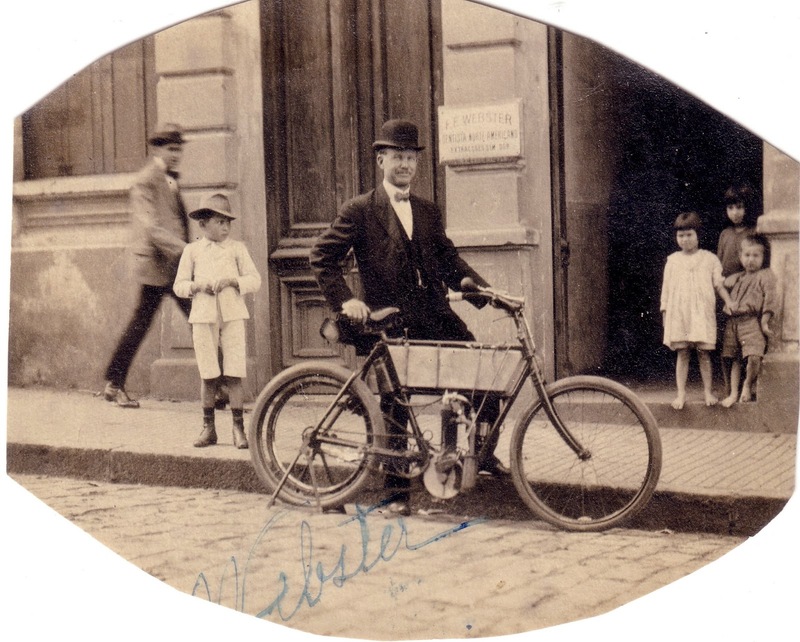 Talented Tuesday - My Great-Grandpa Was An Inventor? Yep, it turns out that my "Traveling Dentist" Great-Grandpa, Watson (Frederick) Emory Webster, was also an inventor! My uncle (Frederick's grandson) alerted me to this fact. He did a search on Google.com for Frederick Emory Webster and found a patent that was awarded to Frederick in 1899. Frederick invented improvements to a Dental Handpiece. Thank you to my uncle for passing this interesting information on to me! My uncle also told me that Frederick had another talent besides being a dentist, optician, photographer, and inventor. This is what my uncle wrote to me about Frederick, “My dad (your grandfather) also told me that he could write with both hands simultaneously and would do it to show off.” Kind of a quirky talent, but interesting information nonetheless. Unfortunately the answer to the question above is no (sigh). But we are making great progress! What am I talking about? Why, Indexing the 1940 Census, of course. Last week a former student from my family history class asked me when we would be able to search the 1940 Census (and no, he did not ask in a whiny little kid voice like in my blog post title). I, of course, couldn’t give him a definitive answer. It all depends on when the indexing gets finished. (Insert shameless 1940 Census Indexing plug here). I did mention some ways he could search for the people he was looking for in the meantime. There’s the awesome website SteveMorse.org (thank you Steve Morse!). But to use this website we need to have an idea of where our ancestors were in 1940. So my student could check the 1930 Census (maybe his ancestors still lived at the same address in 1940? ), and he could also look at WW2 Draft Registration Cards for the address listed there. Maybe his ancestors lived at that address in 1940. Another idea is to look through old photos too. I lucked out and was able to find my dad with his parents and siblings in the 1940 Census because I have an old photo with the address of their first house on it. I Found Clark Gable's Mechanic in the 1940 Census! There are probably lots of other useful resources out there to help us find our ancestors in the 1940 Census while we wait for it to be searchable. Would anyone like to share their success stories and how they were able to find their ancestors in the 1940 Census? If so, please leave a comment. If you've already blogged about your successes please leave a link to your blog. Okay, here comes the Indexing Plug—If you haven’t signed up yet to help us index, please sign up. We need you. Besides, it’s fun and rewarding too! And it’s a great way to give back. Oh, and a big Thank You to all you indexers and arbitrators out there!! Keep up the great work! You guys are awesome! Ancestry.com. Newark Daily Advocate (Newark, Ohio) 13 December 1889 "Jumped to Death" [database on-line]. 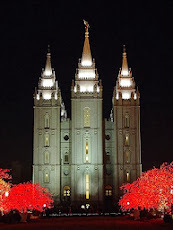 Provo, UT, USA: The Generations Network, Inc., 2006. Original data: Newark Daily Advocate. Newark, OH, USA. Database created from microfilm copies of the newspaper. Charles L. Crippen, the unfortunate sleepwalker who plunged to his death on 12 December 1889, was my 1st cousin 3 times removed. He was born in Ohio on 25 September 1869. Charles’ parents were Lawrence C. Crippen and Lucy Mae Waterman, both from Ohio. I first discovered the cause of Charles’ untimely death when I found a newspaper article attached to his Find A Grave Memorial. I did a bit more digging and found another newspaper article (above) about poor Charles. What a tragic death! Also, I just can’t imagine how terrible Charles’ dad must have felt since he was the one to wake Charles in the first place. These are my paternal grandparents on their wedding day – Arthur Harry Iverson and Ingrid Anna Gillberg. Ingrid’s parents emigrated from Sweden sometime between 1907 and 1911. Ingrid was born in the United States. Arthur and Ingrid were married at the home of Ingrid’s parents in Ely, White Pine, Nevada on 27 June 1931. I was reading through the transcript of my Grandma Ingrid’s vocal history, and she said that one of the Christmas traditions she and her family had when she was growing up was to decorate the ceilings with paper from corner to corner. It looks like the family did the same thing on this festive occasion of Arthur and Ingrid’s marriage. P.S. You may remember Arthur from my previous blog posts titled I Found Clark Gable's Mechanic in the 1940 Census! and Tombstone Tuesday - Arthur Harry Iverson. This is the tombstone of Arthur Harry Iverson, my grandfather (aka Clark Gable’s mechanic from a previous post titled I Found Clark Gable's Mechanic in the 1940 Census!). Arthur is buried at Forest Lawn Memorial Park, in Glendale, Los Angeles, California. My husband took this photo of Arthur's tombstone when my husband and I were on a trip to Southern California back in 2007. I love this picture of Arthur playing his mandolin. Arthur must have come from a musical family. His older brothers played guitars and violins and also made the instruments as well. This is my 2nd great-grandfather, Mathias Rodrigues Vasques. He was born about 1834 at Rio Grande, Rio Grande do Sul, Brazil, and passed away there in 1890. I find it interesting that the hat sitting on the chair resembles a U.S. Civil War era hat. It must have been the style of the day globally? I don't know. Any military buffs out there want to comment on this photo? I assume he is an officer because of this picture from the Wikimedia Commons website below. 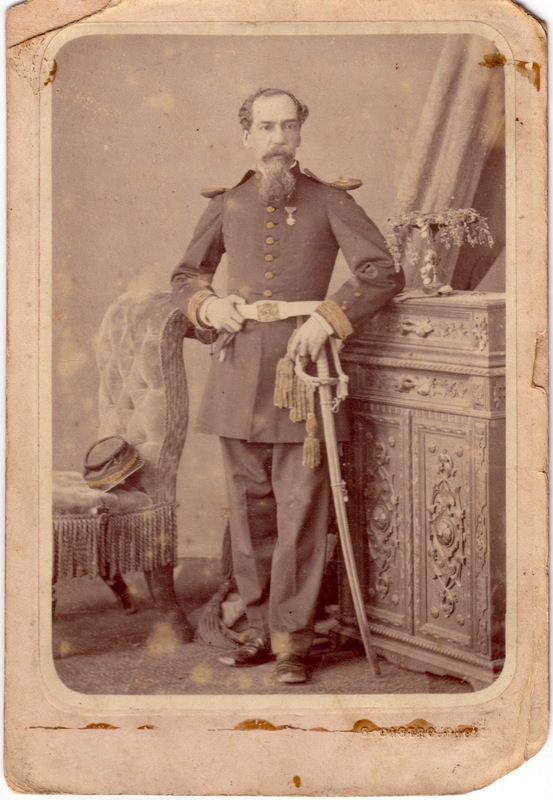 "Oficial e soldado do Imperio do Brasil, uniformes da Guerra do Paraguai. Desenhos de Hendrik Jacobus Vinkhuijzen publicados pela primeira vez em 1867." 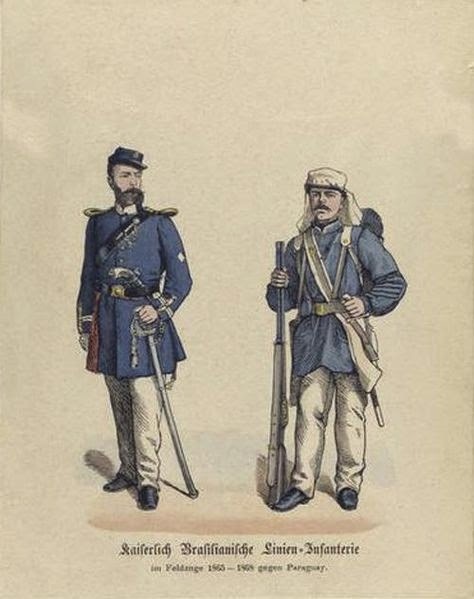 "Officer and soldier of the Empire of Brazil, Paraguay War uniforms. Hendrik Jacobus Vinkhuijzen drawings first published in 1867." Now I need to find out if there are any military records from Brazil that I can research to add to what I already know about Mathias. I Found Clark Gable’s Mechanic in the 1940 Census! There he is on line 64 with his family—Arthur Iverson, my grandfather! According to my grandmother Ingrid Gilberg Iverson, Arthur’s wife, when Clark Gable brought his car to the garage where my grandfather worked, Clark preferred Arthur to be the one to work on his car. Sometimes Clark would even stay and watch my grandfather work on his car. I also heard that Clark Gable seemed to be a very nice, genuine person. Of course, I'm not claiming that my grandfather was the only mechanic Clark Gable used to work on his cars. But it is really cool to hear that my grandfather was one of his mechanics. And one that he preferred at the garage where Grandpa Arthur worked. 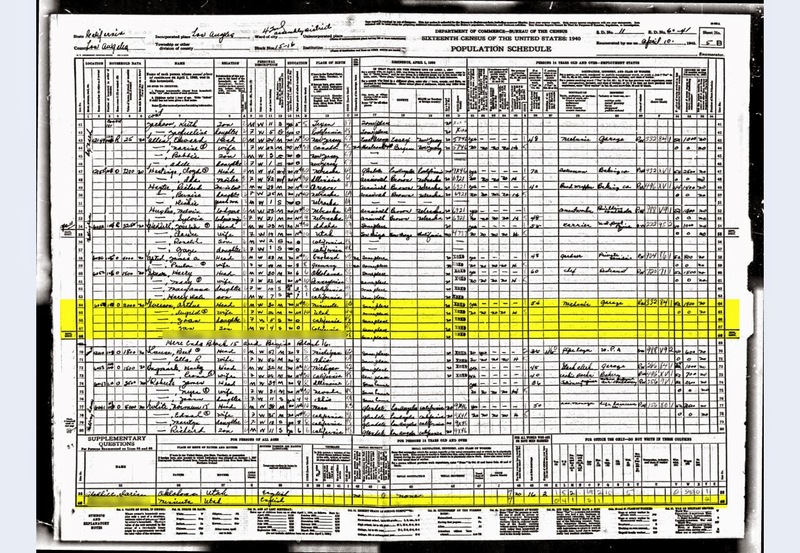 In the 1940 Census, Arthur is listed with his wife Ingrid and their three children. I've blurred the name and information for the youngest child on this census for privacy reasons. Jan, the middle child is my father. Arthur and his family lived at 6058 N. Bellingham Avenue in North Hollywood at the time of this census. Here’s a picture of their house. It’s so awesome that I had this picture of my dad’s first house and that it had the actual address listed too. Because I had the address of the house, I was able to locate my dad in the 1940 census. I used the website Stevemorse.org to find the correct enumeration district I needed so I could locate my dad and his family in the census. Thank you Steve Morse! It’s especially neat to see this census because just two years after it was taken, my grandfather, Arthur Iverson, passed away. To see him in a census with his family is really cool. 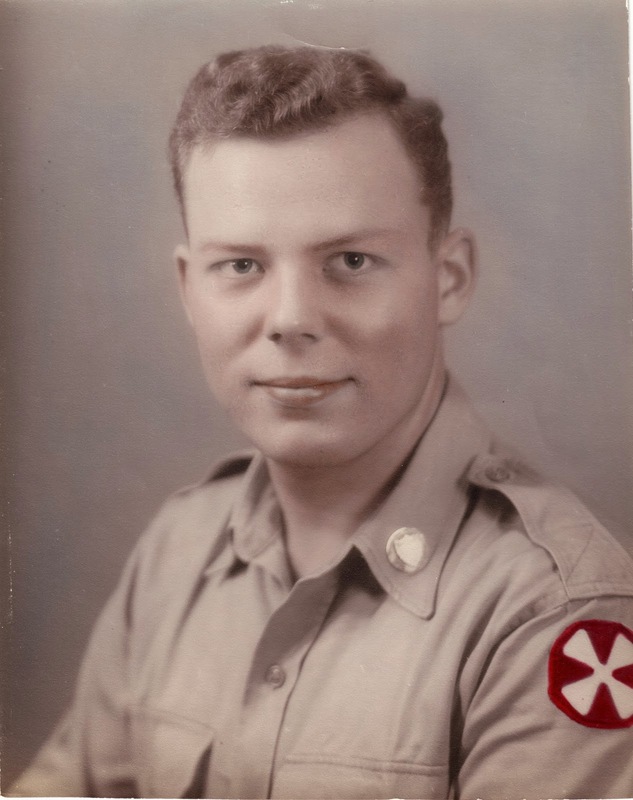 Here’s a picture of my grandfather, Arthur Harry Iverson. Year: 1940; Census Place: Los Angeles, Los Angeles, California; Roll: T627_375; Page: 5B; Line 64; Enumeration District: 60-41. Ancestry.com. 1940 United States Federal Census [database on-line]. 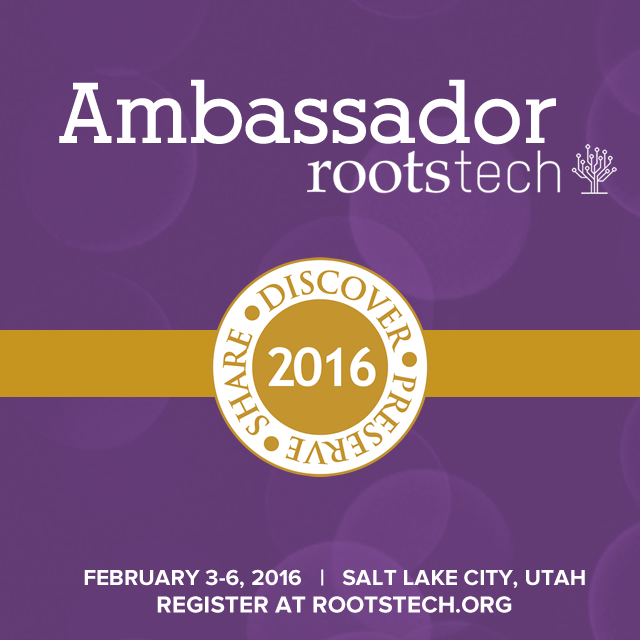 Provo, UT, USA: Ancestry.com Operations, Inc., 2012. This is a picture of Cynthia Maria Waterman, taken on the Photo Boat belonging to her son, Frederick Emory Webster. You remember him don't you? He is my great-grandfather, the "traveling dentist" you met in my previous posts. 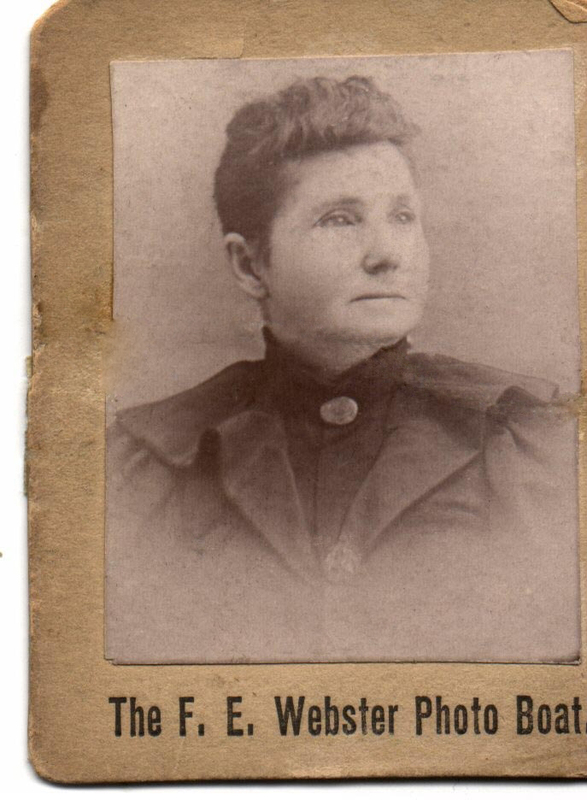 Cynthia was born on May 21, 1836 in Coolville, Athens, Ohio and died on September 22, 1895 in Marysville, Marshall, Kansas. Her parents were Asher Waterman and Bathsheba Paulk. As you read in my last post about my "traveling dentist" great-grandfather, Frederick Webster, he and his wife Esther were in Arriaga, Chiapas, Mexico for the birth of their first child, Carlota. For some reason they decided to relocate to Brazil. The rest of their children were born in Santos, Sao Paulo, Brazil. Staying true to his "traveling ways" Frederick, as well as his wife, Esther, traveled from Mexico to the United States and from Brazil to the United States while their children were very young. Here is a passenger list dated October 19, 1911.1 On lines two and three are listed Carlota and her mother Esther. They were sailing from Veracruz, Mexico. Unfortunately there is no destination listed, although we know it is somewhere in the United States. For Esther, in the column "Nationality (Country of which citizen or subject)" Mexico is listed, but is crossed out and the initials U.S. were written in instead. Because Esther married a U.S. Citizen between the years 1855-1922, she automatically became a U.S. Citizen. Perhaps that's why her citizenship was corrected. ﻿I found Esther and her children in two more passenger lists, both in the year 1913. 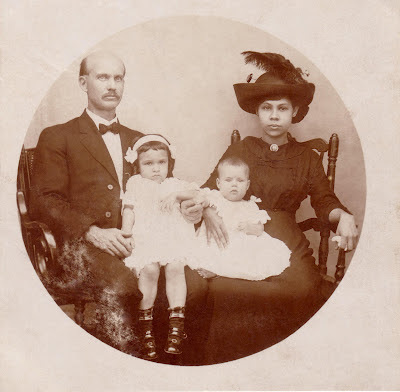 Here she is listed with her two children, Carlota - age 1, and Edna - age 3 months.2 They sailed from Santos, Sao Paulo, Brazil on January 29, 1913 and arrived at the Port of New York sometime in February 1913. Interestingly, the passenger list states that Esther was born in El Paso, Texas. And under "Address in the United States," Chiapas, Arriaga, Mexico is listed. Perhaps those were accidentally reversed and she was heading to El Paso, Texas. Frederick did have ties to El Paso, Texas as evidenced by his passport application of 1907. Another interesting, and possibly confusing, item is the statement that Esther's husband was born in Chicago, Illinois. He was really born in Coolville, Athens, Ohio. But, in 1913, Frederick's brother, Rollin, and father, Ebenezer, were living in Chicago, Illinois. Perhaps there was a little confusion there on Esther's part. 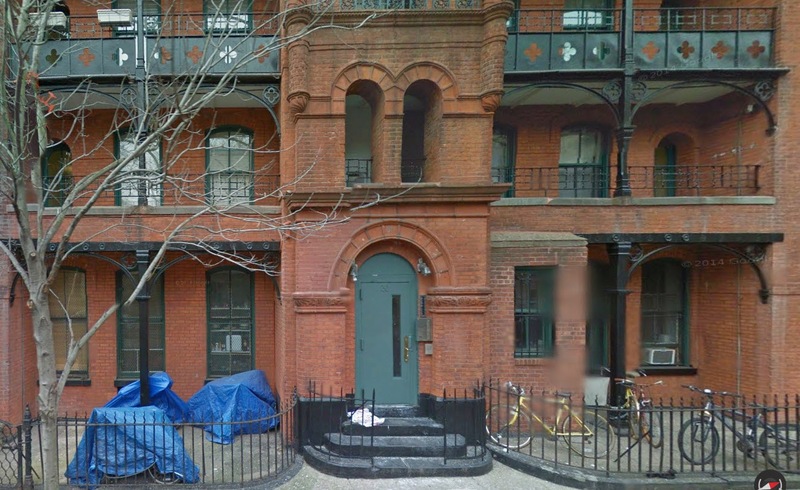 This time an address in the United States was listed for Esther and her children - 30 Columbia Place, Brooklyn, New York. I looked up that address on Google Maps and this is what I found. The interesting thing about the Brooklyn, New York address is that Frederick was on a passenger list for a ship sailing from Santos, Sao Paulo, Brazil on September 8, 1913 and the address in the United States listed for him was Brooklyn, New York.4 This ship sailed on September 8, 1913 and arrived at New York on September 28, 1913. That was a 20 day voyage! Just imagine Esther, a young mom, traveling by herself on a ship for 20 days with her baby in 1911 and then again in 1913, this time with her two small children?! And in the year 1913 she made this voyage two separate times! Wow! The next time I see Frederick traveling is in 1921, after Esther's death in 1919. In the following passenger list Fred is sailing with his children Carlota, Edna, and Debs (my grandfather).5 Carlota was listed separately on another page.6 They were sailing from Santos, Sao Paulo, Brazil to the Port of New York again. Another address was listed in the United States. This time it was 44 Beekman Street, New York City. I didn't know that my great-grandfather had any ties to New York, but it appears he did! ﻿Frederick apparently wasn't done traveling! Here he is in Arkansas this time. 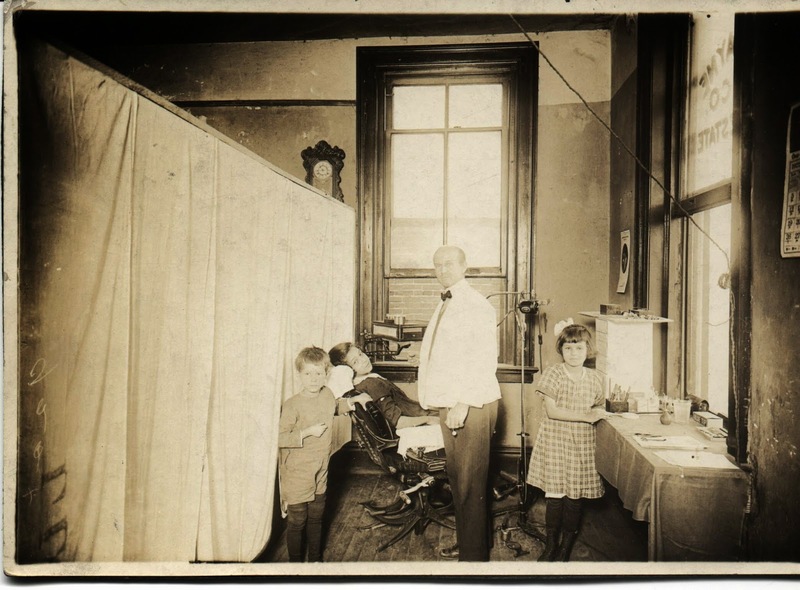 This is a photo of Frederick Webster with his children - Carlota (in the dental chair), Edna Lillie (in the checked dress), and Debs (my grandfather). This is in Brinkley, Arkansas between January and April, 1922. Seeing Carlota in the dental chair reminds me of myself as a young girl sitting in the dental chair of Debs, my grandfather. Debs followed in his father's footsteps and became a dentist too! 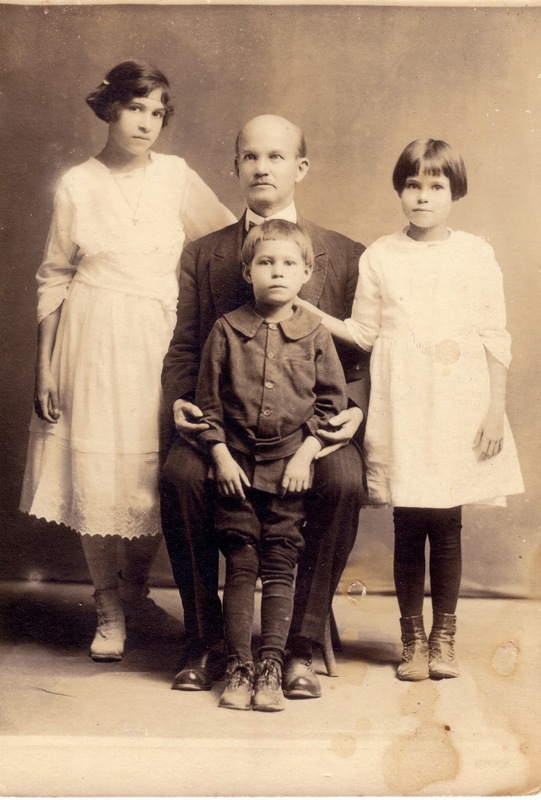 This last photo is of Frederick with his daughters, Carlota (far left), and Edna (far right), and his son Debs (my grandpa). The photo was taken in Irapuato, Guanajuato, Mexico on April 3, 1923. I also found evidence that Frederick traveled to Louisiana in 1922 and 1926. Yes, great-grandpa Webster, you definitely were a "traveling dentist!" Frederick passed away on July 21, 1946 in Santos, Sao Paulo, Brazil. I know this was a very long post. 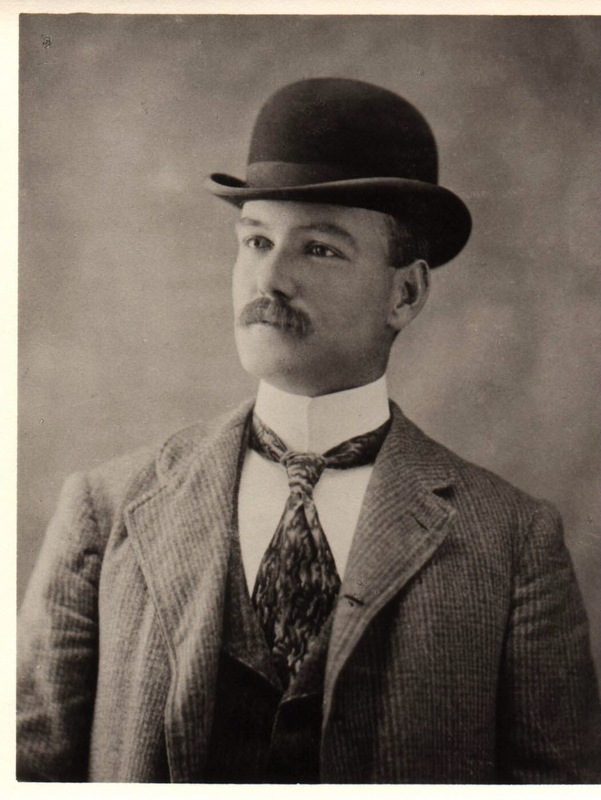 Thanks for letting me share with you the story of my "traveling dentist" great-grandfather Frederick Webster! So, just where was my "traveling dentist" great-grandfather, Frederick Webster, all those years from 1902-1946? I have made a timeline for him and it shows that Frederick was a prolific traveler! 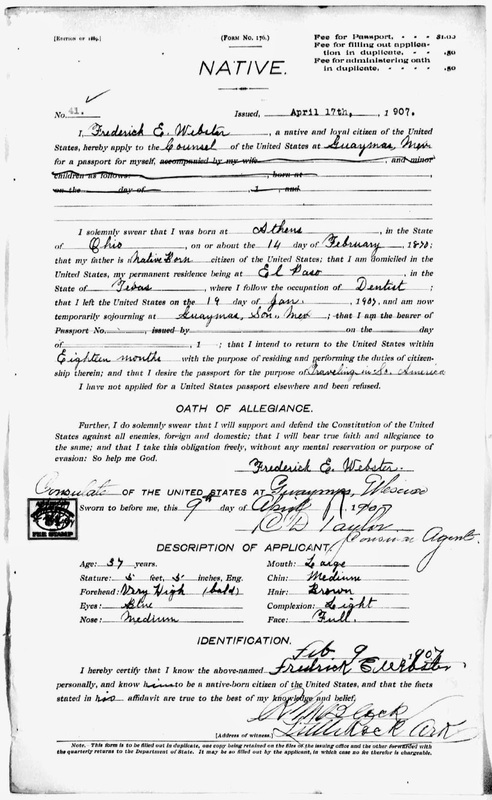 Here is his passport application issued April 1907.1 It states that his permanent residence was El Paso, Texas, that his occupation was a dentist, that he left the United States on January 19, 1907 and that he was residing at Guaymas, Sonora, Mexico. The application also states that his purpose for the passport was for traveling in South America and that he intended to return to the United States within eighteen months. 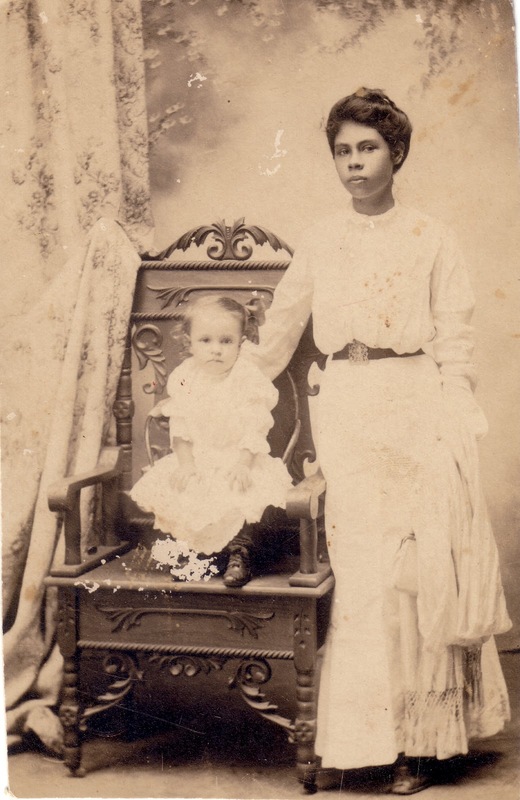 I don't know all the places in Mexico where Frederick traveled, but I do know that he traveled to Arriaga, Chiapas, Mexico at some point because that is where he met his future wife, my great-grandmother, Esther Matus Villatoro. Unfortunately, Esther Matus Villatoro Webster died on November 2, 1919 in Santos, Sao Paulo, Brazil. According to Esther's death record she died of Tuberculosis. And three of her children died before 1923. Only Carlota and my grandfather, Debs, survived to adulthood. My grandfather, Debs, didn't talk a lot about his growing up years. I think it must have been very painful for him to talk about his childhood because of the death of his mother and three of his siblings. I just LOVE this picture of Fred and Esther with two of their children. Esther's hat is so pretty! Fred, Esther and their children traveled between the United States and Mexico and Brazil. I found several Passenger Lists listing this family and their travels. More on that in an upcoming blog! See you then! The release of the 1940 Census has been a very exciting event for us genealogists. I've done a bit of searching and indexing already. In fact, I already found my dad, 4 years old at the time, living with his parents and siblings in the 1940 Census. So cool! But that's another story. I knew I wouldn't be able to look in the 1940 census for my "traveling dentist" great-grandpa, Watson Emory (Frederick) Webster. Well, I now know exactly where he was in 1940. 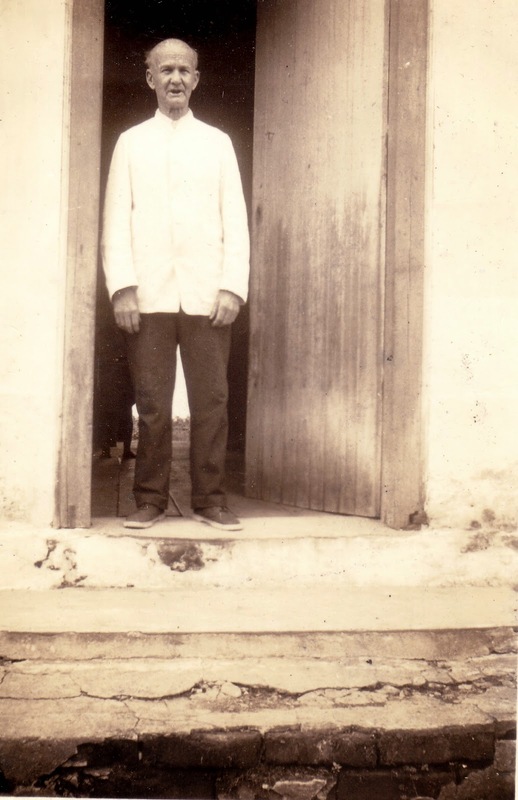 I found this picture of him standing in the doorway of a house in Xiririca, Sao Paulo, Brazil. This picture is dated December 29, 1940. Frederick passed away six years later on July 21, 1946 in Sao Paulo, Sao Paulo, Brazil. So, where was Frederick Webster between 1902, where we last documented him at Lake Charles, Louisiana on his Dental and Photo Boats, and 1946 in Brazil, where he passed away? More details on Fred's life in my next blog. See you then! P.S. If you haven't yet volunteered to help index the 1940 Census, please do so...we really need you!